As one of the leading causes for late-onset blindness, Glaucoma impacts more than 3 Million Americans as well as 60 Million other people worldwide. The Glaucoma Research Foundation states that approximately 10% of the 3 Million Americans who suffer from Glaucoma have been left completely blind by the degenerative disease. According to the World Health Organization (WHO), it is the second leading cause of blindness worldwide behind uncorrected refractive errors and cataracts, and is the primary cause of blindness for people over the age of 60. Studies have also revealed that if you are African or of Hispanic heritage, you may be 6 to 8 times more likely to develop blindness from Glaucoma than your white counterparts. Although there is no known cure for Glaucoma, blindness or vision loss can be prevented if the disease is caught in the early stages of development. Below, we will discuss how the disease progresses, the symptoms of Glaucoma, the detection measures, and the treatment methods. Glaucoma is a disease that can take one of a few forms, all of which, if left unchecked, can result in severe damage to the eye's optic nerve. This optic nerve—which contains more than 1,000,000 delicate nerve fibers—bridges the light-sensitive tissue of the retina to the brain. If the nerves are damaged, your eye’s ability to capture and process visual information deteriorates until it reaches a point of no return. 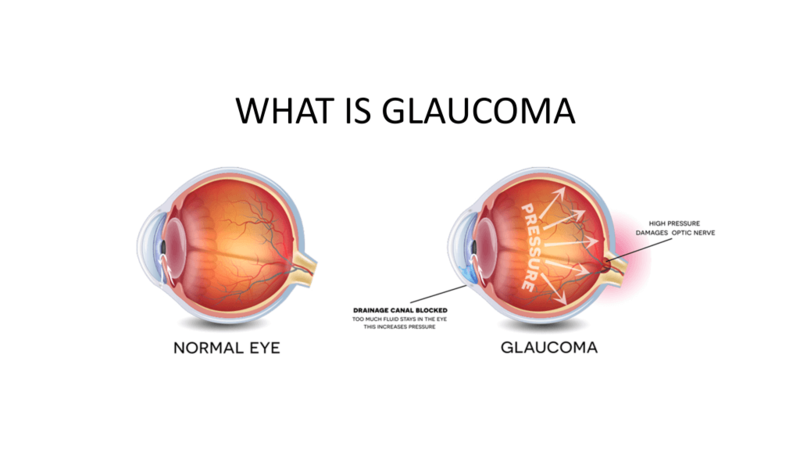 Glaucoma can occur in either just one eye or in both. It primarily affects your field of vision by disrupting peripheral vision, thus constricting your field of view. There are two major forms of Glaucoma as highlighted below. Naturally, everyone experiences different levels of eye pressure; there are certain pressures that may be normal for some eyes that could result in damage to other eyes. Add this to the fact that Glaucoma may take a while to manifest symptoms, if they do appear at all, and it is easy to see why it is so essential that you periodically submit yourself to a comprehensive dilated eye exam. Your eyes continuously produce a liquid known as aqueous humor. This clear liquid runs through the frontal area of the eye and serves dual roles of both nourishing your eyes and keeping them inflated. When new aqueous humor flows into the eye, an equal amount should naturally drain out through the drainage angle. This uniform flow creates a stable intraocular pressure. If the flow is working as intended, your eyes will function normally. However, if the drainage angle is blocked or working improperly—as in the cases of Glaucoma—fluid builds up, which creates pressure in your eyes, causing damage to the optic nerve if the angle remains blocked. Continued pressure on the micro nerve fibers kills the fibers. As more and more nerve fibers stop functioning, blind spots will accrue. Unfortunately, thousands of nerves need to die before you can ever begin to notice the loss of vision. By this stage, the blindness that has already occurred is irreversible. As mentioned, some genetic modifiers may impact the likelihood of developing Glaucoma. But the primary risk categories are shown below. Visual field test – A test that gauges your peripheral vision and determines the range of your field of view. Visual acuity test – A standard eye test that determines your vision’s distance accuracy. Dilated eye exam – Eye drops are administered in order to dilate your pupils. A special magnifying lens is then used to inspect both your optic nerve as well as the retina to search for signs of damage. Pachymetry – A numbing drop is applied to your eye and an ultrasonic wave instrument measures the thickness of your cornea. Tonometry – A numbing drop is applied to your eye and a tonomoter is then used to measure the pressure inside the eye. AI-based detection – Using an AI-based automatic detection system like EyeSee Glaucoma that analyzes retinal images to identify Glaucoma. This new technology is designed to enable point-of-care screening, grading, and reporting for Glaucoma, making screening far more accessible. The most common and least invasive early treatment for Glaucoma involves taking eye drops or pills to decrease eye pressure or to help drain fluids from the eye. A procedure that uses a laser to create miniature holes in the angle in order to prevent blockages and help drain fluid from the eye. This is often used in conjunction with medicinal treatment. An invasive surgery where a small piece of eye tissue is removed to create a new angle for aqueous fluid to drain through. The eye is an extremely delicate and finely tuned mechanism. Unfortunately, we currently do not have the science nor the technical know-how to restore sight once it is lost. This makes it even more critical to encourage patients to be proactive in taking preventative screening measures if they wish to protect their long-term eye health. Detecting Glaucoma early is the best way to ensure that all the proper procedures are taken to bolster the eye and decrease fluid pressure. Glaucoma Research Foundation. Glaucoma Awareness Month. World Health Organization. Blindness and Vision Impairment. Javitt. J. New England Journal of Medicine. Undertreatment of Glaucoma among Black Americans. (1991). American Academy of Ophthalmology. Glaucoma Diagnosis.